We stared at each other. I had only nano-seconds to make a judgement call. Was that intentional? Did she mean to spill that milk? Or was it an accident? I didn’t want to punish a simple mistake, but on the flip side, I didn’t want her thinking spilling milk intentionally was something I was cool with. Our little ones start out so sweet that we really can’t imagine them every doing anything they shouldn’t on purpose. 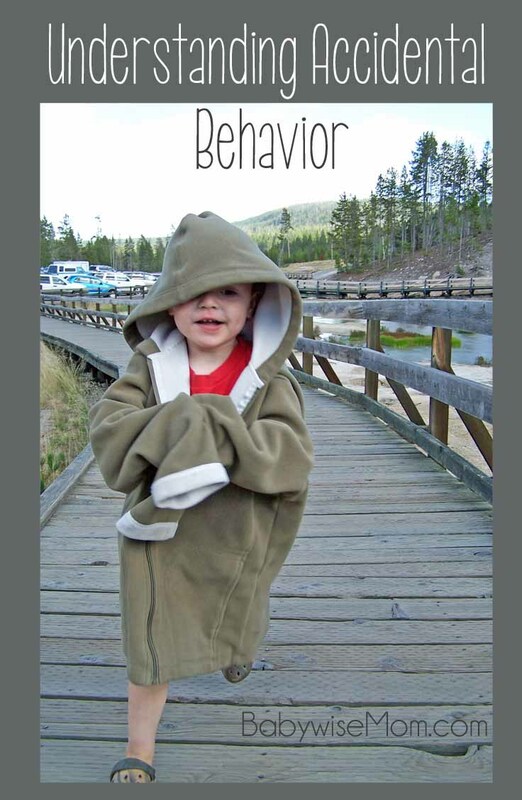 As our children grow, however, we are often encountered with undesirable behavior. Fits are thrown. Tangible objects are thrown. Tempers are lost…behavior leaves innocent land. The first step in knowing how we react to the behavior is to identify if the behavior was “childish” or “foolish.” This post contains affiliate links. This does not increase your cost at all. The book On Becoming Babywise book Two by Gary Ezzo and Robert Buckman talks about childish vs. foolish. Childishness is accidental. It is done because your child is naive and does not understand or know the rules and appropriate behavior. In other words, because your child is a child. Foolishness is when your child is acting out of direct defiance for a rule he or she understands. In other words, because your child is a child. Obviously we will react differently is the behavior is childish versus if the behavior was foolish. 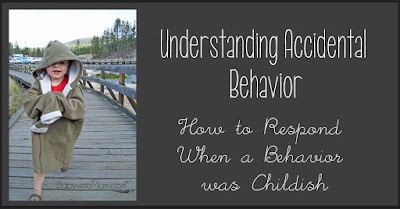 In the early years of my child’s life, I like to err on the side of assuming behavior was “childish.” I make my first assumption be that the behavior was done out of childishness rather than foolishness. It is a time for teaching. As your child gets older and you get to know your child better, you will have a good idea if actions were childish or not. That doesn’t mean you will always judge perfectly. For examples on childishness, foolishness, and in between, see this post: Childishness vs. Foolishness. Prevent childish behavior by teaching your children. Teach them ahead of time what is okay and what isn’t okay. You need to Teach What Obedience Looks Like. You obviously will not be able to cover every situation before it happens. If you are going into a new situation, however, you can do some training ahead of time to give your child knowledge and tools to prepare for it. You can read more about this in my post Training in Times of Non-Conflict. The first thing to do when your child has done something she shouldn’t is to take a moment to decide if the behavior was childish or foolish. Look at your child, analyze the context of the situation, and think through what your child knows and doesn’t know in life. You can ask questions of your child if you need to. Decide if it was childish or foolish. Once you have determined it was childish (on accident), move on to these ideas. Just because an action was innocent or not intentional doesn’t mean that it needs no reaction from you as as a parent. First, react with patience to your child. This is often easier said than done! Let’s take something as simple as spilling milk. That sounds benign on paper. When a child spills a cup of milk, however, it can be very frustrating–even if the spill was just an accident. It can be harder to be patient in a situation like that when the child spilled milk because she was playing superman with her sandwich. She wasn’t meaning to spill, but she spilled not just from young hands but from goofing around. Do your best to be patient. If you lose your patience, apologize to your child. Gently encourage the child in the correct way to act. If a child runs in a place where running is inappropriate, explain to your child what is appropriate. Explain what the child did that was not okay and then instruct on what to do instead. “We do not run in the church. Fold your arms and walk instead.” Again, remember prevention. If your child is prone to run, go over the rules before you enter a place that is not appropriate to run in. Do not make the mistake of simply telling a child what not to do–children benefit greatly with being told what they can do instead. Think of yourself approaching an intersection and not knowing which way to go. You decide to go straight and I tell you, “No! Don’t go straight!” That doesn’t leave you knowing where you should go, just that I don’t want you going straight. Always remember children are very new to life and need instruction beyond just what is wrong. Another step to take is to have your child help right a wrong if needed. Just because something is childish, or accidental, doesn’t mean restitution doesn’t need to be made when appropriate If you are in the store and bump into someone on accident, you apologize. You don’t just say, “I didn’t mean to!” and walk off. Adults (most of them) understand this concept. If a child spills a glass of milk on accident, it is absolutely appropriate for the child to help clean it up as the child is able. If the child hurts someone, the child absolutely should offer an apology (which, by the way, is often very difficult for children to do–they often do not like apologizing for accidents. Side bar–stress to your children that it is important and okay to apologize for things even if no ill intent was there. The action was still done whether it was intentional or not. See I’m Sorry vs. Forgive Me for more on this). You also need to have a lot of patience for your child. Be patient with your child’s efforts. Accept your child’s best. Remember your child is a child. Try to imagine judging life and how to act based only on the last three years of life. That can help you put into perspective what a child automatically know and what she doesn’t. Also realize that children are little scientists. 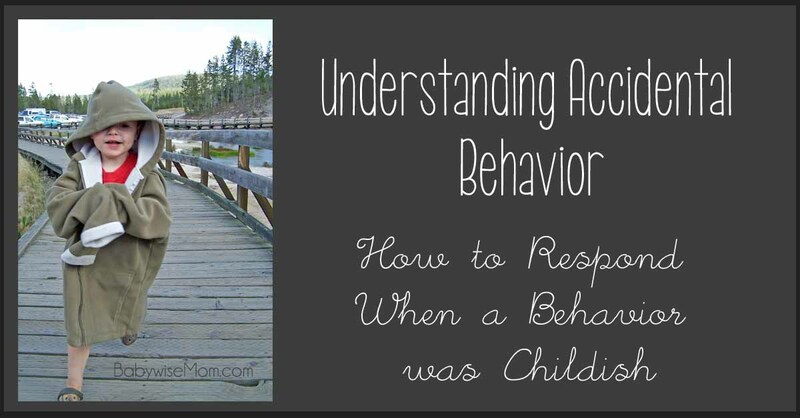 A child will often repeat behavior that she was told was not okay in an effort to figure out exactly what wasn’t okay. This will happen because the child is still building her vocabulary. Brinley has always been very verbal, and she has asked what words mean from a young age. I would give an instruction and she would think for a minute and then say, “What [fill in word] means, Mama?” Your toddler might not fully understand what you meant when you said it wasn’t okay to blow raspberries while eating. So she will try it again and try it with variations so she can figure out what is not okay and what isn’t okay. This leads us to the importance of you being consistent in your corrections. You need to consistently correct for behavior so your child has the best chance of learning what she can do and what she cannot do. Try to explain things clearly and in a way your child can understand. You might need to demonstrate. Do not jump to conclusions. While children often make mistakes, most children make them innocently. Most children are not trying to make you upset or cause trouble. Do not assume your child understands all of the rules and social graces of life. If you have not explicitly taught your child about something, your child likely does not know. A common encounter parents have is the day the child loudly points out something about a stranger. Like the time McKenna asked why a man’s tummy was so big. As parents, we are usually quite embarrassed! The child usually has not ever been told that such a question is not polite. Children are also usually black and white and can’t understand why it isn’t okay to ask a question about what they observe. Do not expect your child to draw connections. Teaching your child to be quiet in one setting is not going to mean that your child will be able to enter a similar setting and draw the conclusion that it is likely necessary to be quiet in the new setting also. As children get older, they are better able to make those connections and judgement but younger children are not. Do not freak out. Maintain your “cool.” Be patient with your child. Be kind in correcting. Overreaction on your part will stress your child out. No one likes to be berated for accidents, including children. I guess no one really likes to be berated no matter the reason. Harsh correction can influence self-worth and make children anxious. Encourage your child to improve and keep working at it. Accept our child’s best effort. Have patience for these moments of childishness–they happen quite often. You can do your best to prevent childish behavior, but you will still encounter childish behavior quite often. It is important to treat it as childish and not as premeditated action. Children take time to learn the intricacies of life. Help your child learn why it wasn’t okay, what would have been okay instead, and how to make restitution if necessary. Next Post *Shrug* You’re Pregnant!